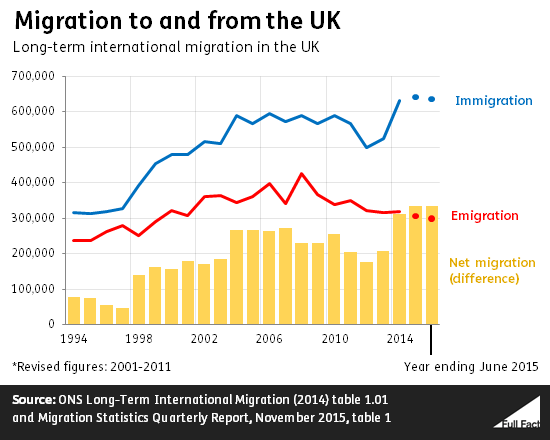 Net migration was around 160,000 in 2009/10 and now it’s at record high levels of 380,000. The figures are wrong, but it’s correct to say that net migration is currently the highest estimate on record. Net migration was 336,000 in the latest set of figures, which count the year to June 2015. In 2009/10 it was thought to be around 205,000-240,000. An earlier set of estimates for 2009 (now revised) put the net migration figure closer to 160,000. These figures aren’t correct, but it is correct to say that net migration is currently the highest estimate on record. Net migration—the difference between the number of people coming to live in the UK and moving abroad—was 336,000 in the latest set of figures, which cover the year to June 2015. That matches the level for the year to March 2015, which is the highest level that’s ever been recorded since comparable records began in 1991. Years prior to that indicate lower levels as well. Working out levels of migration is rather tricky, so there’s always considerable uncertainty in these estimates. The real level of net migration over recent years could be around 40,000 more or less than the estimated level. Alan Johnson was Home Secretary from June 2009 to May 2010. The closest set of figures we have to that period are the year to June 2010, when net migration is now thought to have been around 244,000. So that’s a fair bit higher than the 160,000 he referred to. The figures have been revised for that period, so it’s possible Mr Johnson was referring to the previous set of estimates. In the year to June 2009, it was previously estimated that net migration was 166,000, rising to 235,000 in the year to June 2010. The wider topic of the interview was immigration to and from the EU. EU net migration was 180,000 in the latest set of statistics, and 72,000 in the year to June 2010. Mr Johnson went on to say that he didn’t think restricting benefits to EU migrants would reduce immigration. We’ve covered whether it would in a previous factcheck. Would restricting in-work benefits to EU migrants reduce immigration?